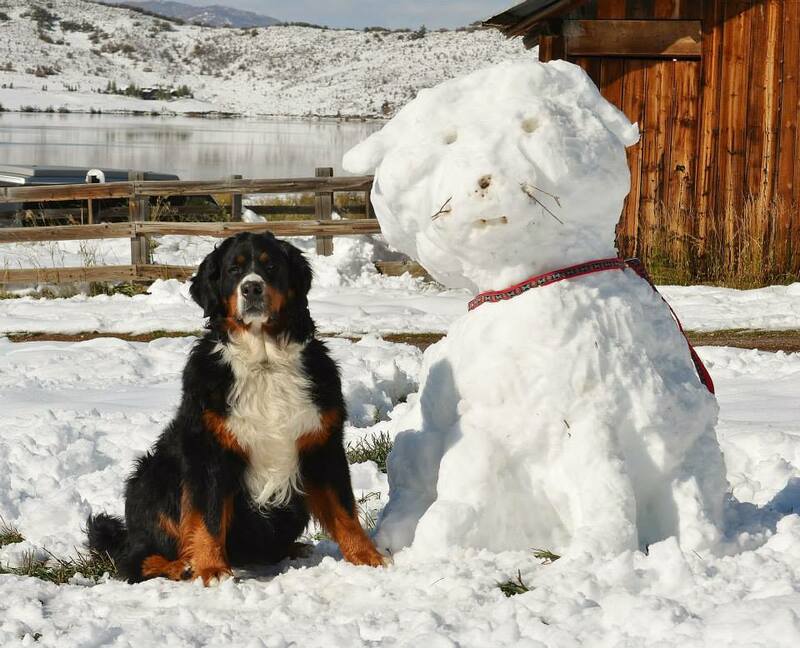 Bernese Mountain Dog's in the Rockies Facebook page. 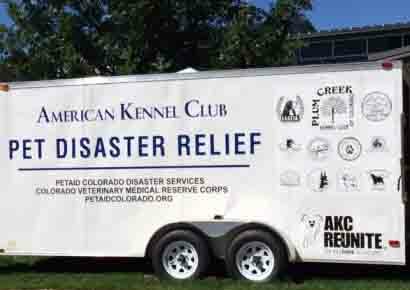 The BMDCR has provided a financial gift to support one of the AKC's disaster relief trailers. These trailers deliver essential, nonperishable pet supplies when and where needed to local emergency teams in the first hours of a disaster before FEMA arrives. You can spot the BMDCR logo near the back end - it's the third logo down. Hank's owner was away and his home was broken into. He was stolen, but five months later police made an arrest in Kansas and he began his trip home to Michigan. Sandy Dunaway drove him to Denver and Christine Mann donated a crate. Then it was a short flight to Grand Rapids and a very happy reunion with his family. The Loveland Reporter Herald has a sad story about Carter, a Berner, who was shot with a .22 and later had to be euthanized. Authorities are looking for the shooter. See the full story. 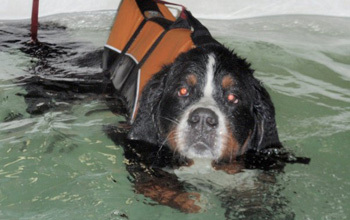 The CSU veterinary teaching hospital is a great resource for Berner lovers in Colorado. Here is short article from their web site on the surgery and Intensive rehabilitation of Willow. 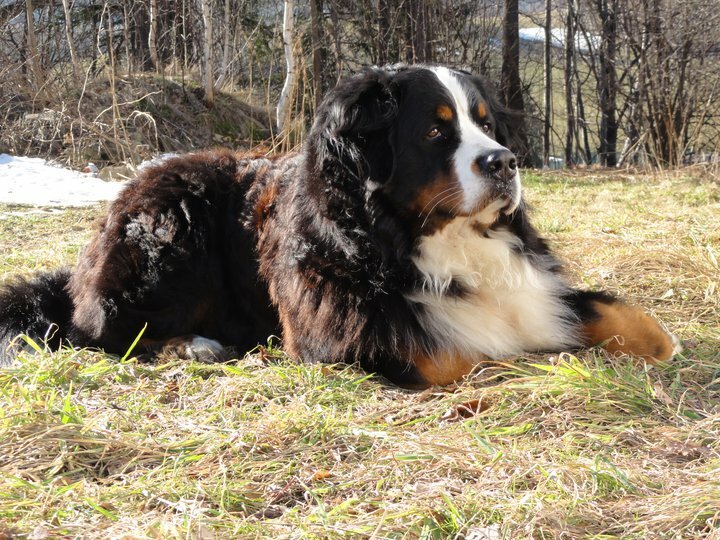 Sahsa, a Berner, fell down a cliff on Mount Ellinor in the Olympic Mountains of Washington and was feared dead. A mountain rescue team found her three days later, injured but alive. She is home now recovering from surgery. Recently released American Kennel Club registration statistics show Berners as the 9th most popular breed in Denver. They are only 31st nationwide. This is not good news however; as high popularity leads to lots of poor quality breeding by commercial breeders and lots of rescue dogs later on. Check with the BMDCR before buying a pup or making a deposit. The February dog shows in Denver are the biggest shows of the year in Colorado. They feature conformation, obedience, rally, and agility. They offer a superb networking opportunity for puppy buyers to meet the most knowledgeable breeders around. 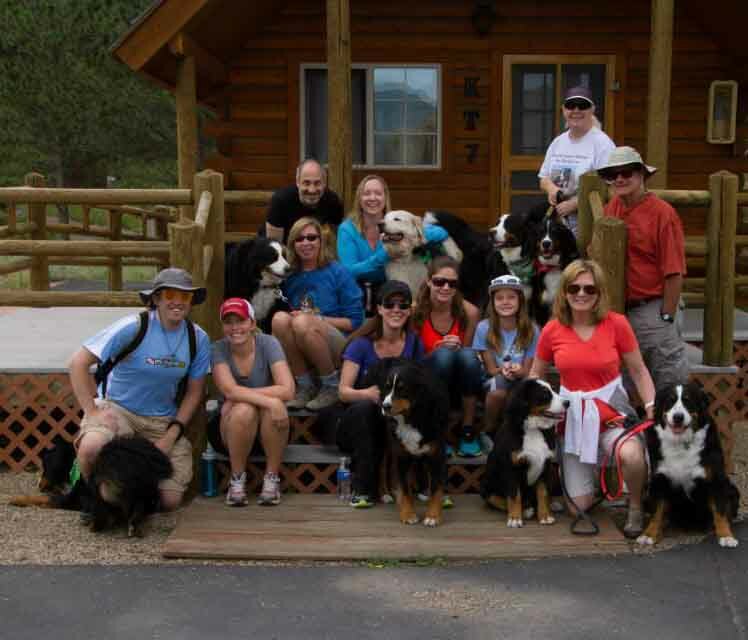 The Colorado Bernese Mountain Dog Meetup Group had a fun weekend getaway with the dogs in Estes Park this July with a pot luck supper, camping, and a pontoon boat ride on the lake. The Meetup group hosts lots of social, Berner friendly activities all along the font range. 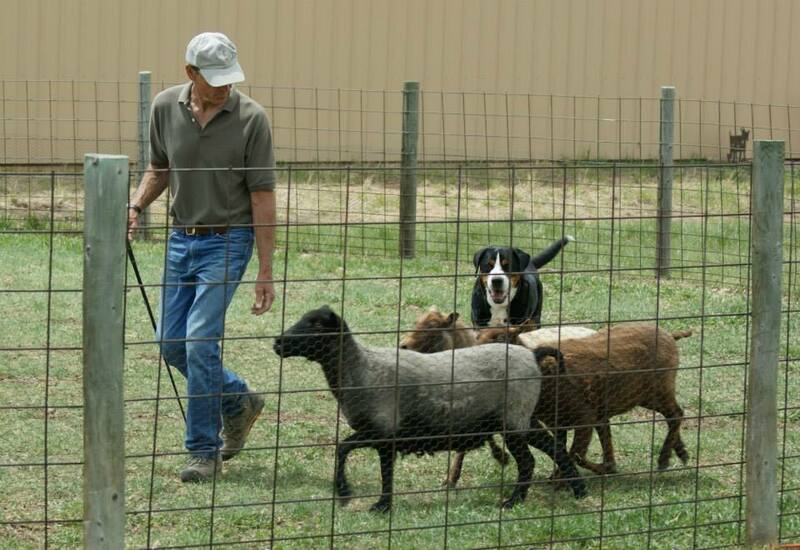 The BMDCR held a herding fun day with instructor Jim De Kieffer at his ranch, Halcyon Farms, in Elizabeth, CO to introduce Berners and their owners to this challenging and fun activity. All breeds were welcome including the Greater Swiss Mountain Dog shown below. The BMDCR Spring draft tests were held in Littleton, CO this year and the entries were full both days. Chairpersons, Lou Tucker and Lori Kennedy, along with Trial Secretary Vicky Whitney, selected a nautical theme for the event which went well with the warm Spring weather. 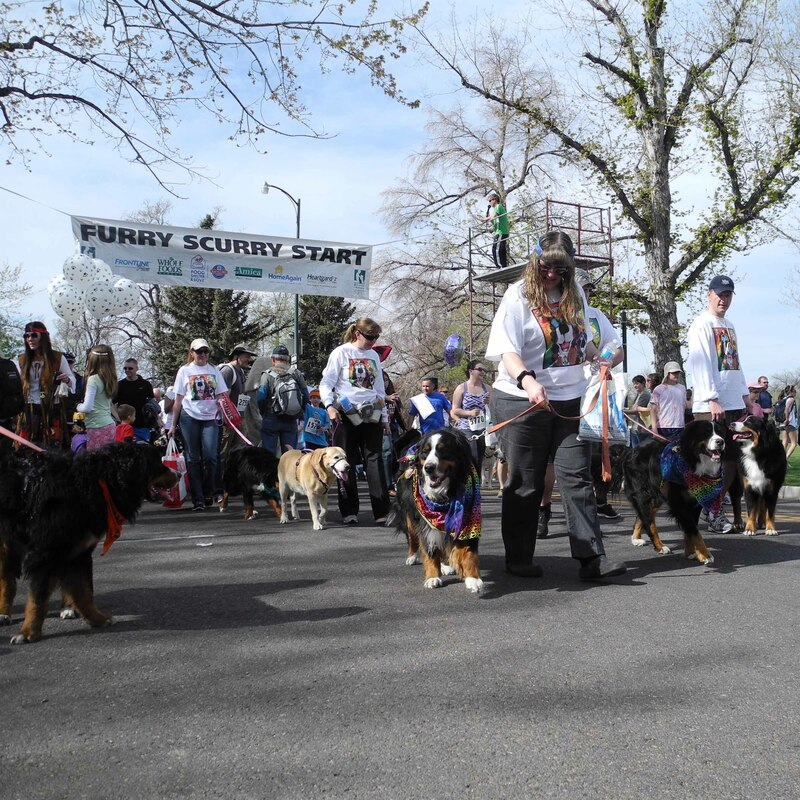 Congratulations to the Bernese Mountain Dogs and Friends Furry Scurry team. They raised over $22,000 for the Dumb Friends League in their mission to help homeless pets in Colorado. That's three times what they raised last year and participation doubled. BMDCR members gathered on January 20 to celebrate last year's high points and accomplishments. Barb LeTourneau screened a year end review video, awards for titles earned were given, and the Kathy Roth award was presented to Elaine Wultuski. Despite frigid temperatures, 60 Berners led Santa's way into town at the Breckenridge tree lighting ceremony on December 7. 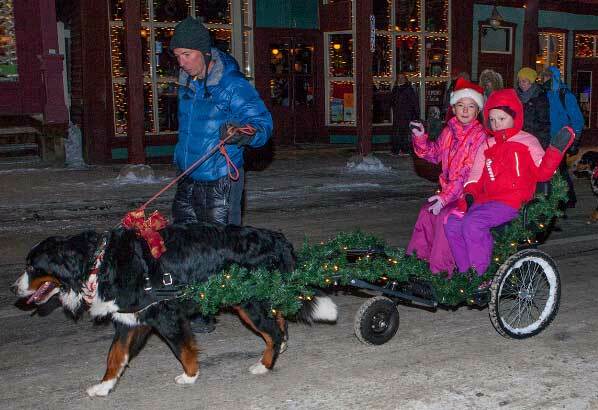 The Breckenridge Resort Chamber provided festive lights for the dogs while Breski Bones supplied dog treats and The French Bakery served up people cookies. Thanks to Gail Marshall for organizing this great event. Heavy snow hit the Steamboat Springs site of the BMDCR Fall draft test but the test came off without a hitch and the dogs loved it. The BMDCR draft clinic was shortened from two days to one this year and the new format was very well received. For beginners, this is a great way to get started carting with their dogs. Experienced trainers help novices avoid the more common pitfalls and guide more experienced owners into polished handlers. 2013 was the year for the BMDCR to host the national specialty. The specialty is a Berner only dog show that draws participants from all over the country - and even the world There is something for everyone: draft, obedience, conformation, agility, herding, tracking, plus social and educational events. It's a huge undertaking to host this event but a lot of fun too and very rewarding. The eye and heart worm clinic saw over 25 dogs. The eye exam looks for inherited diseases and is one of the five necessary health checks for all breeding Berners. Thanks to Dr. Todd Hammond of The Eye Clinic in Wheat Ridge and Dr. Nancy Fusleier. Dr. Hammond exams Dr. Fuselier's dog "Moose"
The Colorado Berner Meetup Group turned a lot of heads when 30 or so members and their pups went for a nice winter stroll around Washington Park in Denver. The Meetup group hosts lots of fun activities for Berners and their people. Specific information concerning ring times, ring numbers, and the number of Berners entered will be available about one week before the show date. Although drafting is the Bernese Mountain Dog's traditional work our breed can also excel as a pack dog. Berners are already eligible to participate in the Greater Swiss Mountain Dog club's pack dog events and Ron Abbott has earned the WPD pack dog title with his dog, Steiger. Ron led five Berners and a Sammy on a pack hike this June on the Colorado Trail. Dr, Fick, orthopedic surgeon at Alameda East Veterinary Hospital, reviewed the common Berner joint problems and treatment options at the July meeting. Hip dysplasia, elbow dysplasia, and torn CCLs are well known to Berner owners. 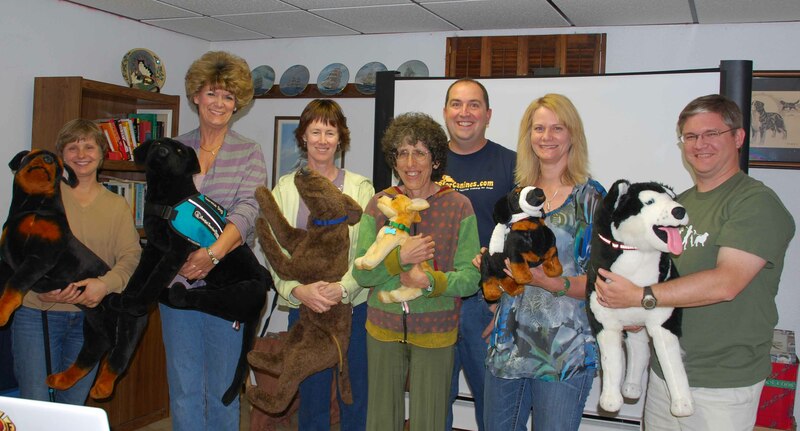 The proud alumni of our canine first aid class pose with their practice dogs after graduation. Thanks to Candy for arranging this educational program. Bernerfiesta this year was at Don and Lori's home and their hospitality was terrific. The Colorado Bernese Meetup Group joined the BMDCR for food and some doggie socialization. They also held CGC testing with four dogs earning their titles. Kristen with "Clementine" keeping cool in her evaporative vest. The Colorado Bernese Mountain Dog Meetup Group joined together to support the Dumb Friend's League at their Fall dog walk and fund raiser. Good fun for a great cause. Thanks to Buffy and Mike for organizing this meetup. 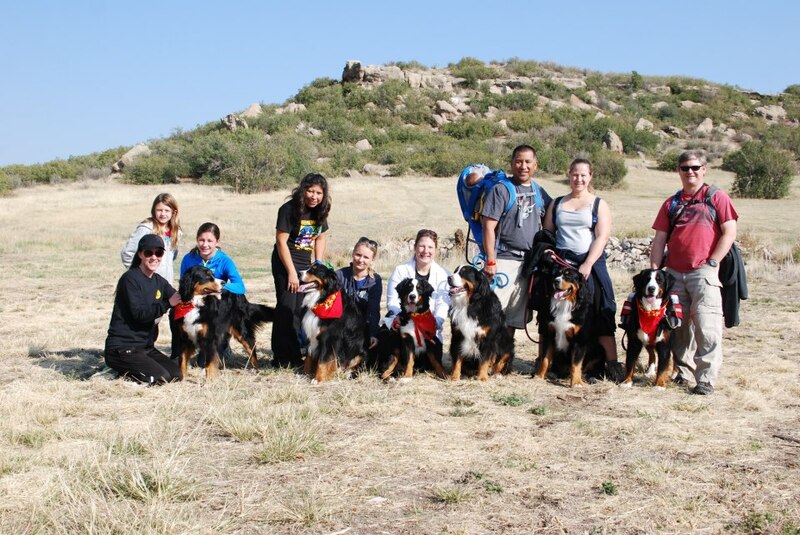 What is the Bernese Mountain Dog Club of the Rockies (BMDCR)? The BMDCR is a group of people who love Bernese Mountain Dogs. It was founded in October, 1987. It is an official regional club recognized by the national breed club, the Bernese Mountain Dog Club of America (BMDCA). Members includes people who are involved in breeding, showing, and all areas of training, as well as those whose Berners are cherished family members. What kinds of programs and services do they offer? The BMDCR's first--and most important--purpose, as stated in the Constitution, is "to provide a source of information and support to fanciers of Bernese Mountain Dogs." Thus, education is the focus of many of their activities. Recognizing that the informal network established between Berner people can be an equally valuable source of information and support, the club also sponsors purely social events which give an opportunity to get to know each other and have fun with the dogs. General club meetings are held every other month. Since the majority of club members live in the Colorado Front Range area between Fort Collins and Colorado Springs, they hold most meetings at a central location in the Denver area. All general meetings include both a business meeting and sometimes an educational program of general interest. Past programs have covered a wide range of topics related to health, behavior, training, showing, grooming, and breeding. Most of their social activities are designed to include dogs. Their big event of the year is the summer Bernerfiesta, a potluck picnic that includes activities for the entire family. In December, they have a Christmas party. To maximize participation, they hold activities in various locations around the state of Colorado. Because of the Berner's large size, most owners find some obedience training to be a necessity. Starting training early, before a puppy has attained adult size and assertiveness, makes the process much easier. As part of the BMDCR's effort to promote responsible ownership among its members, the club strongly encourages all members to give their dogs at least basic obedience training. To help Berner owners appreciate their dogs' many abilities, they have offered clinics on basic obedience training and solving problem behaviors, as well as agility workshops, an ongoing series of draft (carting) classes, and several herding instinct certification tests. In addition to earning formal obedience titles, a significant number of BMDCR dogs pass the AKC Canine Good Citizen Test each year. The BMDCR has put on its own CGC test in the past; the test is also available through many other area dog clubs. At the annual Awards Banquet, they recognize BMDCR dogs who have earned titles in all areas during the previous year, as well as those who have performed public service--for example, as therapy dogs. Since becoming an AKC recognized club in 2008 the BMDCR has held an independent specialty show each Fall. In conjunction with the show, they also offer a variety of activities (e.g., educational programs, a banquet, and a hospitality suite) for Berner fanciers. In 1992, 1997, and 2013 the BMDCR hosted the BMDCA National Specialty. 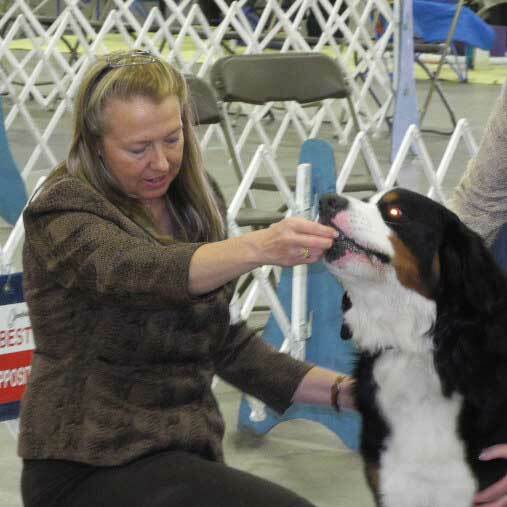 The National Specialty is an annual Berner-only AKC show, hosted each year by a different regional club, which draws an entry of several hundred Bernese Mountain Dogs and their owners from all over the United States and Canada. Specialties include conformation, obedience, tracking, a draft test, and an agility trial, as well as educational programs and fun activities. As a recognized regional club of the BMDCA, the BMDCR is authorized to hold official BMDCA Draft Tests, at which Berners can earn draft titles. They held their first independent draft test in 1993 and they typically offer this event bi-annually in Colorado every year. The BMDCR is committed to educating the general public about Bernese in particular and about responsible dog ownership in general. The Public Education Coordinator handles hundreds of requests a year from people seeking information about the breed. The also maintain a web site and Facebook page. 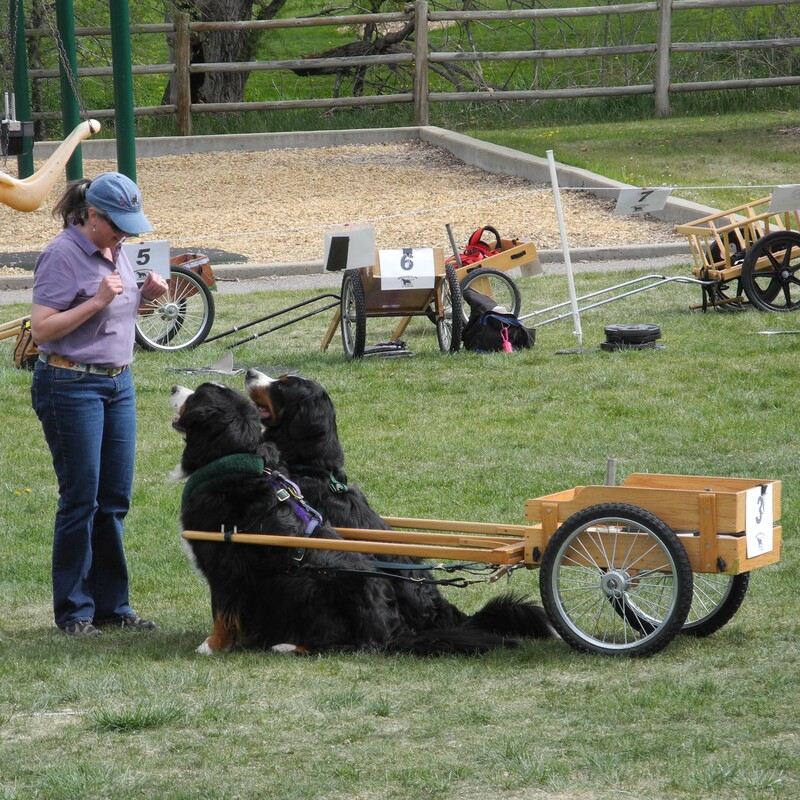 BMDCR members frequently participate in educational showcases for the general public and actively seek out opportunities to demonstrate the benefits of having a well-trained dog, through participation in such activities as obedience and carting demonstrations, parades, and pet therapy. For those who are looking for a Berner puppy, the Public Education Coordinator maintains a list of Bernese Mountain Dog breeders in the Rocky Mountain region who have, or are planning, litters. and also meet certain requirements. Older dogs may occasionally also be available. If you are dealing with a problem situation with your dog--whether related to health, behavior, or training--the BMDCR has experienced people who can advise you. They can also refer you to training classes in your area. 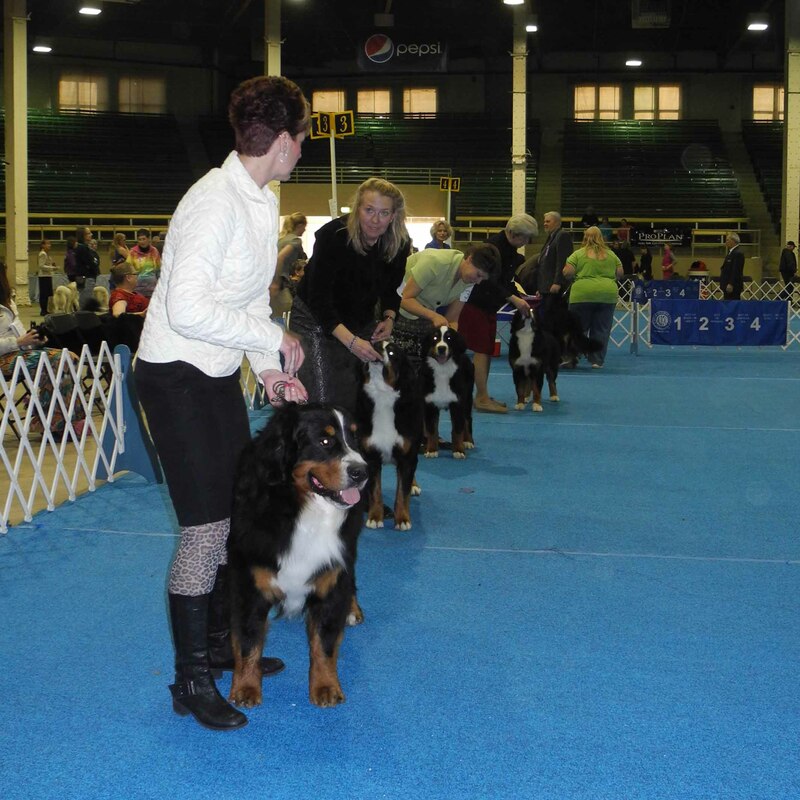 The BMDCR is committed to helping breeders produce the best Bernese Mountain Dogs possible, whether show dogs, working dogs, or pets--dogs that not only conform to the breed standard but that are also both physically and temperamentally sound. They have many experienced breeders in who are glad to offer assistance to people just getting started. They can help the novice breeder decide whether a dog is of breeding quality, as well as provide advice about stud selection, breeding, whelping, puppy rearing, placement, and contracts. Breeders who are members in good standing of the BMDCR and whose litters meet certain basic requirements can have their litters listed with the Breeder Referral Service. The BMDCR actively supports research and data collection efforts toward the goal of eliminating several serious health problems that afflict Bernese Mountain Dogs. 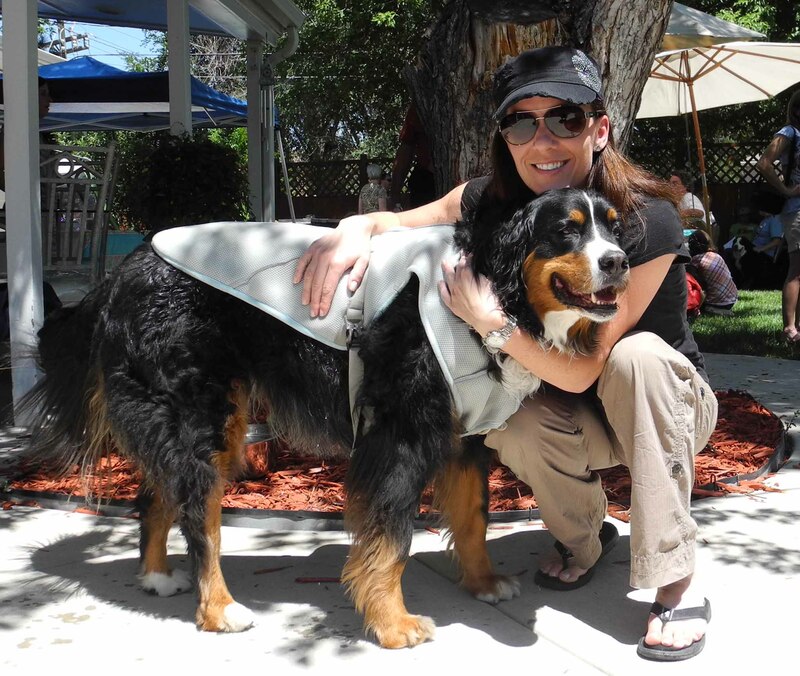 The International BMD Database was started in the 1980's by the San Francisco Bay Berners, another regional club, to collect data on health problems, longevity, and other concerns in the breed. The BMDCA took over administration of the database several years ago. In 1994 the BMDCA launched the Berner-Garde Foundation, a nonprofit, tax exempt foundation, to further develop the database through continuing data collection, verification, and dissemination to interested parties (breeders and researchers). The BMDCR encourages all club members, both breeders and owners, to submit data on their dogs. The BMDCR strongly encourages its members to have all dogs, including non breeding animals, evaluated for genetic ailments. Hip and/or elbow dysplasia can be evaluated from radiographs by the Orthopedic Foundation for Animals (OFA). Hereditary eye diseases can be screened for by local veterinary ophthalmologists and the results submitted to The Canine Eye Registry Foundation (CERF). In 1990 the national breed club, the BMDCA, initiated and funded a nationwide four-year study of cancer and other tumors in Bernese Mountain Dogs, which established that two forms of cancer in the breed have a genetic basis. Many members participated in the original cancer study, and the BMDCR as a whole has financially supported both the cancer study and Berner-Garde. The BMDCR believes that those of us who love Berners are responsible for any Berner in trouble, whether or not it was produced by a breeder in the club. 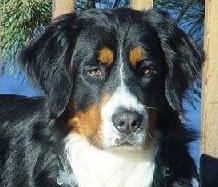 For this purpose, the club has established a Rescue Committee, which has already helped find new homes for many Berners. The club will assist individual owners with placement when they are unable to keep a dog. Rescue expenses are financed from a separate rescue fund. Club members support the rescue program by providing foster homes for rescue dogs, assisting with special fundraising events, or directly donating to the rescue fund. All members can check out materials from the club library. Materials presently available include books (on both the Bernese Mountain Dog in particular and general dog topics), videos (the official AKC breed standard video, as well as videos of previous national specialties and past BMDCR supported entries and draft tests), BMDCA yearbooks (useful for pedigree research), and back issues of the BMDCA magazine, The Alpenhorn. The club annually allocates funds for the purchase of new materials and also accepts donations of materials from members. All members receive a newsletter, the BMDCR Mountain Dog Messenger, which is published bimonthly. It contains information on upcoming club events, reports of recent events, and a listing of shows, fun matches, clinics, and other dog-related activities in the Colorado area. The newsletter also features articles written by members and reprinted from other regional club newsletters and all-breed dog publications. Past articles have covered such topics as breeding, grooming, conformation, showing, pet therapy, dog training centers in Colorado, and mail order sources for dog supplies. Contact the Membership Chairperson for subscription information. Any person with an interest in Bernese Mountain Dogs is welcome to join the club. You do not need to own a Berner. In fact, if you are considering getting a Berner, joining the club is a good way to learn more about the breed and to become acquainted with local breeders. We have no geographic residence requirements. Although many of the members live in the state of Colorado, they also have members in surrounding states and even in a few distant states. BMDCR membership applications are available from the Membership Chairperson or [HERE]. There are three levels available; voting, sustaining, and junior. Voting members are eligible to vote at meetings and serve on committees and the Board of Directors. This level is for those who plan to take an active role in the club and requires attendance at at least two meetings out of the last four before joining. Sustaining members may also serve on committees but are not eligible to vote at meetings or serve on the Board of Directors. This level is for those who may be new to Berners, less active in the breed, or who live outside of the core area. Junior Membership, for all persons under 18 years of age. Voting rights do not extend to Junior Members, nor are they eligible to hold office in the Club. All memberships require two voting member sponsors. If you do not know anyone who is a member of the club the Membership Chairperson will be glad to put you in touch with members in your area. All members are expected to sign and subscribe to the Code of Ethics of the parent club, the BMDCA, which has also been adopted by the BMMDCR. If two or more adults from the same household are applying for membership, all of them must sign the Code of Ethics. To apply obtain both the application and the code of ethics. Fill out the application, sign the code of ethics and return them to the Membership Chairperson. Contact your two sponsors and arrange for them to send their sponsorship forms to the Membership Chairperson also. The BMDCR has a Junior Membership category for children under 18. Junior Members pay reduced dues and do not have voting privileges. Becoming a Junior Member is a way for kids to show support for the club. However, all members' children are welcome to attend club events, whether or not they are officially Junior Members. Many of the club's activities are designed specifically with families in mind. Kids who are especially interested in dogs, and who may already have some experience with conformation and/or obedience competition--e.g., through 4-H or junior showmanship classes--are welcome to participate in the fun matches and training clinics on an equal basis with adults. If your child is just getting started in dogs, they have experienced kids and adults who will be glad to give him or her instruction and guidance. I don't want to join the BMDCR at this time but would still like to get information about activities. Newsletter subscriptions are available for non-members. For more information, contact the Membership Chairperson. 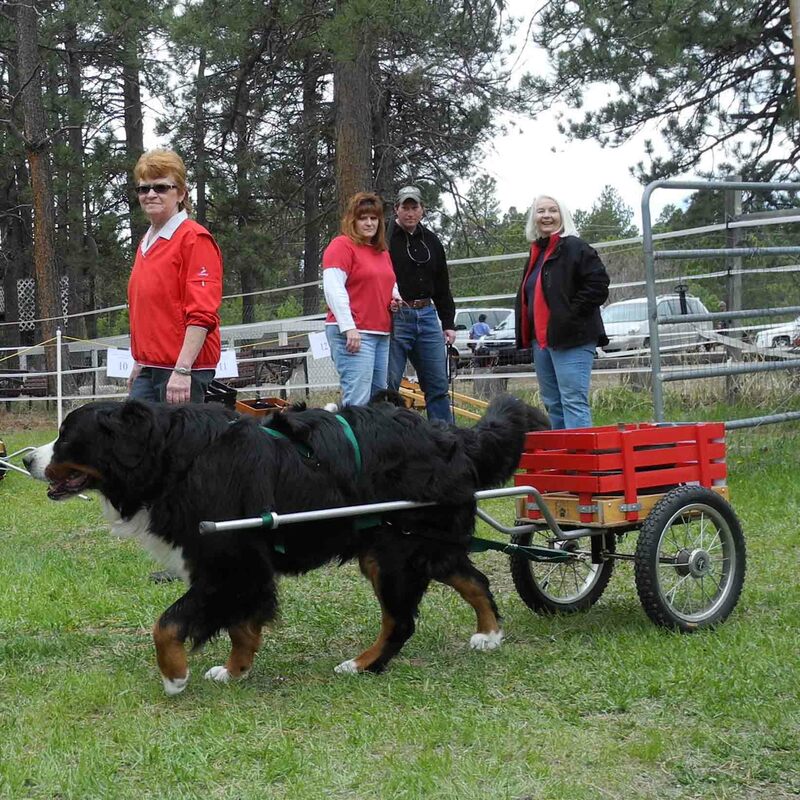 Meetings, fun matches, and most activities are open to all Berner fanciers, whether or not they are club members. Prospective Berner owners, and new owners, are welcome to attend. Very occasionally, for an activity which has a participation limit, preference is given to club members. This will be clearly specified in the newsletter.